Assault rifles are short, compact, selective-fire weapons that fire a cartridge intermediate in power between submachinegun and rifle cartridges. Assault rifles have mild recoil characteristics and, because of this, are capable of delivering effective full-automatic fire at ranges up to 300 meters. Assault rifle, military firearm that is chambered for ammunition of reduced size or propellant charge and that has the capacity to switch between semiautomatic and fully automatic fire. Because they are light and portable yet still able to deliver a high volume of fire with reasonable accuracy at modern combat ranges of 300–500 m (1,000–1,600 feet), assault rifles have replaced the high-powered bolt-action and semiautomatic rifles of the World War II era as the standard infantry weapon of modern armies. ^ China's New 5.8x42mm Weapons Complex Revealed Archived 2007年10月16日, at the Wayback Machine. ^ The Battle Rifle: Development and Use Since World War II. p. 1-2. https://books.google.com/books?id=_a0zAwAAQBAJ&pg=PA1. 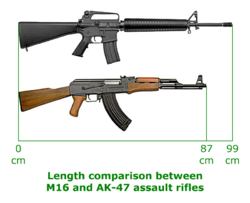 ASSAULT RIFLES AND THEIR AMMUNITION: HISTORY AND PROSPECTS, 11 June 2009[リンク切れ] Archived 2014年6月2日, at the Wayback Machine.